While watching a flock of birds feeding in a cemetery here in Santa Rosa, I caught a brief glimpse of one with the dark cap and wings of an American goldfinch, but with white feathers over the rest of his body instead of yellow. Of course, when I tried to get closer for a better look he flew off. 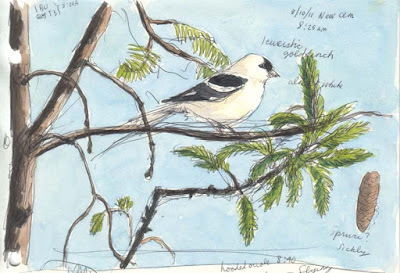 The next day I went back, and the day after that, to see if he would return, and was pleasantly surprised to see him both days along with another similarly colored bird in a small flock of normally colored goldfinches. Since both birds had dark eyes and all the black pigmentation was normal, I was pretty sure they weren't albino. Having no idea what else to search for I began there anyway. I found many sites discussing and showing pictures of an astonishing variety of species of birds with color aberrations. 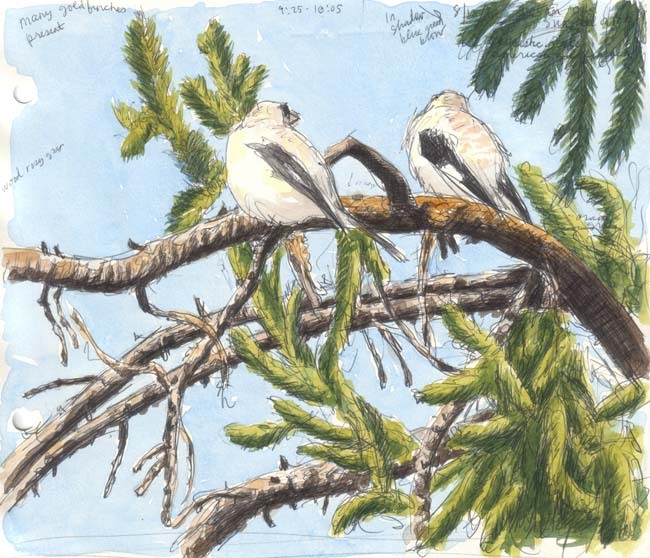 On some sites the birds I saw were described as "partial albino". An equal number of sites scoffed at that and insisted that the birds were leucistic (loo-KISS-tick). If I understand what I've learned about how birds get their colors, yellow and red coloration are produced by carotenoids while melanin produces the "earth" colors, i.e. browns and black. Leucism is caused by a lack of melanin. The goldfinches I saw seemed to be doing just fine in the melanin department so is it really leucism? Most of the articles I read state that it's impossible to be partially albino as albinism is, by definition, a complete lack of melanin. So, not partially albino, either. Which leaves me wondering...well, a lot of things. And still not really able to give a name to the altered color of these not-so-gold finches. 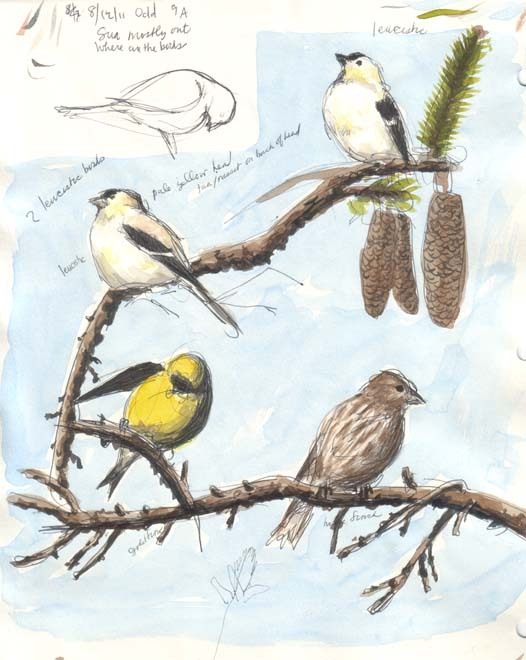 Project FeederWatch, Plumage Variations: Albinism or Leucism?